Francis Landey Patton, a native of Bermuda, began his teaching career at McCormick Theological Seminary in Chicago. He was called to the seminary in Princeton, where his reputation as a teacher and theologian — and his popularity as an after-dinner speaker — grew rapidly. Even those who disagreed with his rigid, conservative Presbyterian views admired his intellect and wit. His election as McCosh’s successor did not meet with unanimous enthusiasm. Many had hoped not only for a devout educator, but also for an experienced administrator who would bring efficiency to the expanding College. 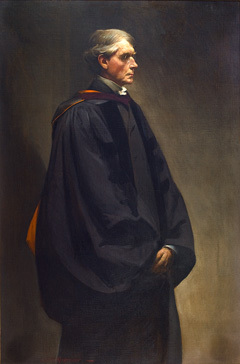 Faculty accounts indicate that Patton lacked initiative in important policy matters, resisted meaningful curriculum reform, and was lax in matters of discipline and scholarly standards — in short, as one colleague said kindly, he was “a wonderfully poor administrator.” But students of the 1890s were unanimous in their affection for him. In the fall of 1896, Patton proclaimed a three-day holiday to celebrate the Sesquicentennial of the College and to confirm its new official name, Princeton University. In the process, he changed the wording of the seal from Collegii Neo-Caesariensis to Universitatis Princetoniensis, retaining the open Bible at the center and returning to the ancient motto: Dei sub numine viget (Under God’s power she flourishes).